JACKSON, WYOMING, HAS A WAY OF ROMANCING PEOPLE. First it’s about looks — the Tetons, of course — but in time the place reveals an unexpected depth. After a while it shows itself as more than a pretty face, more than a ski town or a travel hotspot. Jackson is a community with history, soul and tradition is anchored by landscape and respect for the hearty kindred spirits who fall in love with the place. That’s just what one midwestern couple discovered years ago. What started with a one-time ski vacation to Jackson Hole Mountain Resort has evolved into a second home that resounds with the values of family and a new tradition of gathering in Jackson. 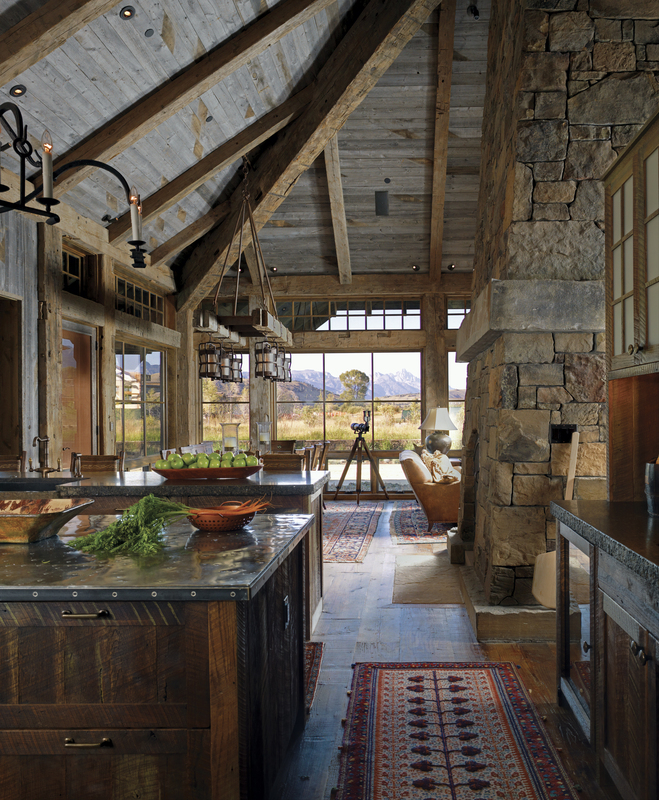 When the time came to build a home here, the feeling of connection intuitively led the couple to the renowned architectural firm, JLF and Associates, of Bozeman, Montana. When they met with Paul Bertelli, Design Principal at JLF, they emphasized that the home must be modest in style, yet large enough to accommodate extended visits with friends and family. They experienced an interview process that was a departure from the usual discussion of must-haves, such as the size of a great room, kitchen appliances or even the materials of the building. Instead, they talked about living. Noting that JLF’s reputation preceded Bertelli, the owners had been to several JLF-designed homes in the Jackson area and heard good things about their work in the West and throughout the country. They were intrigued by the signature use of timeless materials, quality construction and unmatched attention to detail. Founded by Jonathon Foote in Livingston, Montana in 1979, with the philosophy that a house should add beauty to the landscape rather than overpower it. He started a movement of reusing weathered materials — timbers from barns, bridges, fences — to preserve and revere the history of place, particularly in the American West. Bertelli and his team continue with the same dedication to Old World craftsmanship, natural materials and rustic style with a definitive language of personal design. As a result, JLF remains at the forefront of contemporary place-based architecture. The philosophy at JLF & Associates is unique. When Paul Bertelli talks about architecture he discusses people — how they live in a space, whether they value privacy or company and how they relate to the land. His approach is that architecture is about process, not product. What emerged from Bertelli’s interactions with the homeowners was a set of traditional values with honesty, humility and openness at its core. The result is a stalwart house with a subtle elegance that is inviting rather than grandiose. The covered front entry leads to an arched wooden door, surrounded by stone. Through the front door the warmly lit foyer greets with an embrace of stone, a graceful staircase and glimpses of natural light. Further into the house, the stone becomes more prominent as one realizes it is a tremendous, foursquare pillar reaching from the floor to a pyramidal ceiling made of antique timbers that span and continue outside as exposed rafters. The stone element defines the focus of the home as the hearth, literally and theoretically — saying, this is where we gather and that’s important. Centered square in the main living area, the stone column unites living, dining and kitchen spaces with three fireplaces. A wall of windows reveals a long view of the Teton Range to the northwest, as the impeccable golf course wraps around the southern side of the house. The owners drew in the expertise of trusted designer Bruce Kading, of Beson Kading Interior Design in Minneapolis, whom they had worked with on other projects. Kading opted for a subdued palette of natural tones — sandstone, muted reds, browns and hints of green taken from the lichen-covered stones in the fireplace. The resulting interiors exude a sense of calm that allow the texture of the materials used inside and outside the home to emanate their natural beauty. Bridging the garage and game room to the main house is a second-level walkway that transitions from a utilitarian stairway to bunk room and downstairs toward the main living area. The effect is an attractive, functional space that helps to mass the 8,000-square-foot home in a way that it doesn’t seem immense. The connection helps spread the mass and maintain the subtlety of the architecture. Working with Jackson-based Big D Construction to build this solidly unembellished home, JLF achieved a dwelling that reflects the owners’ quiet principles. 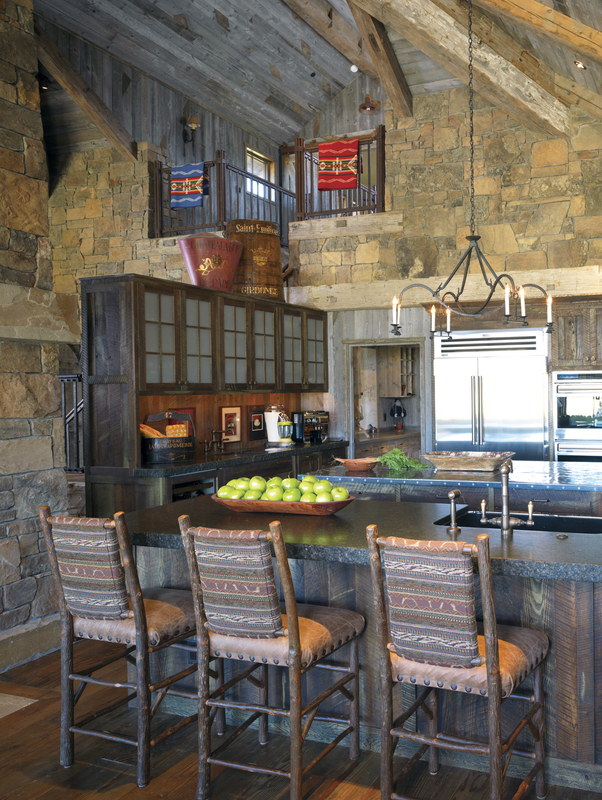 Additionally, 3 Creek Ranch is in line with the owners’ values. At a glance, it doesn’t offer the most obvious amenities associated with Jackson Hole. First of all, the Grand Teton views aren’t as prominent as other developments. The skiing is about a 30-minute drive. Situated on the southern edge of the valley, town is also a short drive away. Yet, the thoughtfully planned golf and fishing community is home to the headwaters of Blue Crane Creek, Cody Creek and Spring Creek. Promoting conservation efforts, naturalist programs and dry fly, catch and release-only fishing, it’s more than a high end housing development. Like the greater community of Jackson, 3 Creek Ranch offers multiple layers of intrigue. In the end, an easy relationship with the landscape is what defines the house. The low profile roofline and steadfast presence suit this spot, where the final curve of the Tetons bend toward the Snake River Range, where a wellspring feeds three creeks, where the profound sensibility of this home simply belongs. Marking architectural design with quality, JLF and Associates infused this home with details: Hand forged fireplace tools; the patinaed iron of the fireplace screen by blacksmith Bill Moore; the artful inset of a copper clad window within stacked stone; a hand-forged iron banister by Bill Moore which architect Paul Bertelli likens to chafes of wheat in a bundle. 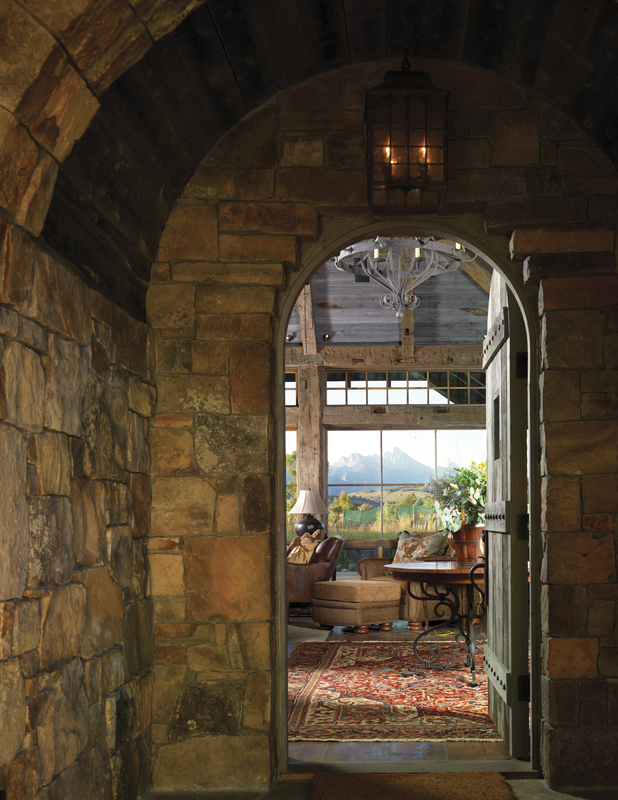 An arched doorway with Old World charm leads to layers of beauty with the Grand Tetons visible in the distance. In the open living space, custom features, such as the patinated metal finish on the kitchen island or the one of a kind chandelier over the dining room table, are details that cultivate a uniquely personal feeling within the home. Interior designer Bruce Kading allowed the subtle tones of the natural materials to imbue calm throughout the home, but with appropriate shots of color from Pendleton blankets and antiques. 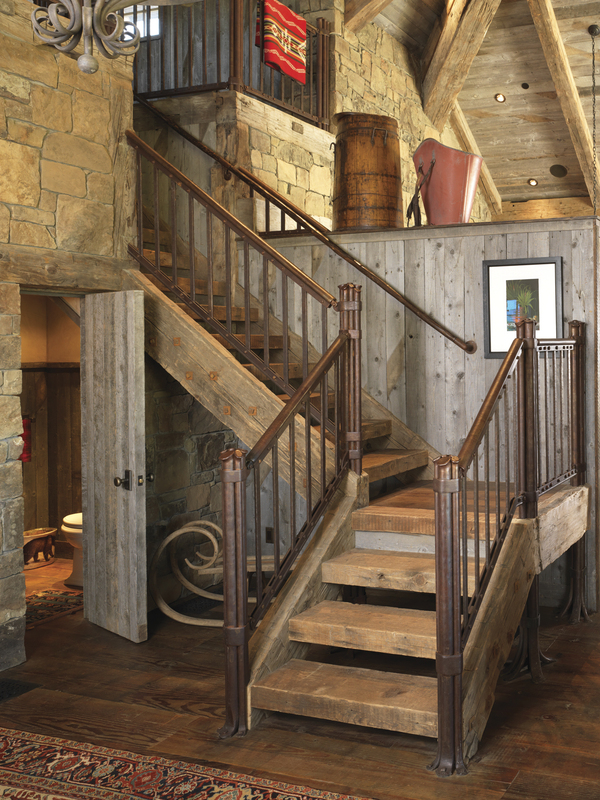 A central staircase, adorned with a contemporary hand-forged iron railing, leads to a bunkroom. 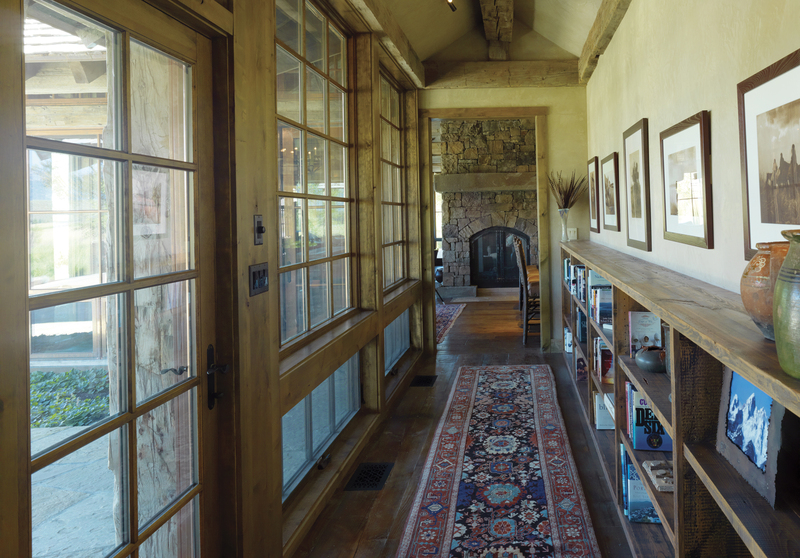 Architects JLF and Associates utilized a passageway for bookshelves and as an elegant wall to display the homeowners’ collection of Edward Curtiss vintage photographs.